Notes: Look for tubes of cooked polenta in the supermarket refrigerator case; they are often stocked near the cheese. Rinse eggplant and trim off and discard both ends. Cut eggplant crosswise into 8 equally thick slices. Cut polenta crosswise into 8 equal rounds. Lightly coat a 14- by 17-inch baking sheet with olive oil cooking spray. Arrange eggplant and polenta slices in a single layer on sheet. Lightly coat tops of slices with more cooking spray. Bake in a 425° regular or convection oven until eggplant is soft when pressed and polenta is heated through (cut to test), 20 to 25 minutes. Meanwhile, in an 8- to 10-inch nonstick frying pan over medium-high heat, stir onion, garlic, and basil occasionally until onion is lightly browned, 4 to 5 minutes. Add tomato purée and 1/4 cup water; simmer uncovered, stirring occasionally, until flavors are blended, 5 to 10 minutes. Add salt and pepper to taste. Cover and keep warm over low heat, stirring occasionally, until eggplant is done. When eggplant is soft, sprinkle mozzarella and parmesan cheeses equally over eggplant and polenta. Return to oven and bake until cheese is melted, about 2 minutes. 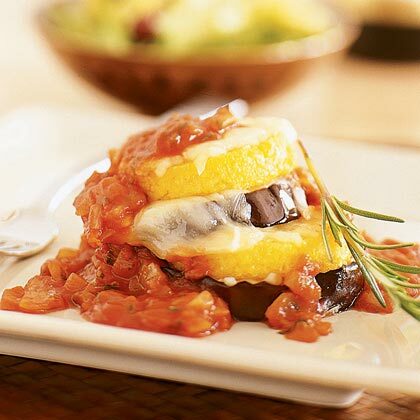 On each of four dinner plates, place 1 eggplant slice (use largest slices first) and drizzle with 1 tablespoon sauce; top with 1 polenta slice and 1 tablespoon sauce. Repeat until all slices are used. If desired, garnish each stack with rosemary sprig. Spoon remaining sauce around base of eggplant stacks. Serve with breadsticks.